A little over a year ago I was lucky enough to go to the USA and UK for an extended break. Being a bit of a sports fan, I went out of my way to plan one or two special games into our schedule….. baseball and football….. we went and watched the Yankees play at Yankee Stadium in New York and Chelsea play at Stamford Bridge in London. Both occasions were just brilliant….. but also quite distinct, different. Yankee Stadium is really a stylised coliseum, which seems to suit the game of baseball well. There are cheap seats and expensive seats, which means that pretty much anyone can come to the game if they want – if you’re strapped for cash you can get in with a great view of the game for less than $20 US. 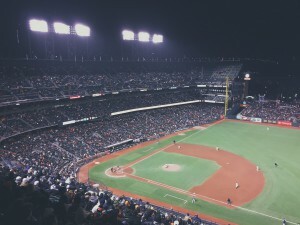 The way in which the seating is layered and stretched around the field of play also means there is no place where you can’t get a good clear view of the pitcher and the batter, the core of the action. And the fans were friendly, everyone was polite and friendly. Stamford Bridge is a big blue crucible of pleasure (pain for opponents) that does several things well, but one thing utterly superbly. It carries the human voice, in song, to anthem like proportions. The singing of English football fans is legend, what I didn’t realise was that their wit should be too. An English Premier League game on TV conveys the noise of the singing but not the detail of the words, at Stamford Bridge we heard all that. Suffice to say that most of it was un-PC, some of it unrepeatable, and that the ref didn’t get off too well. So what’s all this got to do with Lean and business improvement? I guess what I’m really trying to talk about here is style and culture and how these things affect value for money. From what I could see, Yankee Stadium looked like a pretty well-run machine, an immaculate engine for pleasure and profit. Stamford Bridge was raw….. well-organised, don’t get me wrong….. but raw. There were no cheap seats, as far as I’m aware and the ‘shed end’ where we were sat was like something out of Lock, Stock & Two Smoking Barrels. We waved our blue scarves, cheered for the blue team and kept our mouths shut. But….. and this is a crucial but….. my wife and I decided that if we could choose, we would go to a Chelsea game every week for the rest of our lives. And pay for it too….. we’d go without to go there. As lean and smooth and efficient as you can make an operation, it still has to have life and for most human beings, a sense of the real. It never pays to forget that when you’re looking at your own processes and operations, especially where they interface with your customer.